All done! !, originally uploaded by woolly fabulous. I ran across this photo on tumblr.com and was blown away! 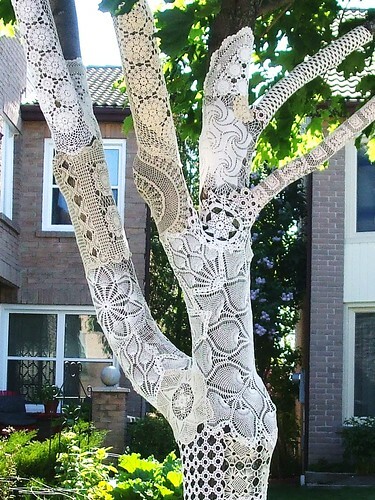 I've seen plenty of yarn bombing or knit graffiti before, but as a non-knitter it never really spoke to me...but this? Vintage doilies? Simply amazingly beautiful. Apparently the sore arms (can you imagine?) behind this is Odile from the Etsy shop Wooly Fabulous, a shop I had already hearted for her gorgeous pincushions made with vintage doilies. With my lottery winnings, I will be flying her over to Ireland to doily bomb all my trees! This week I made pincushions! I found a little china jar with no lid at the car boot sale in Shanagarry a couple of weeks ago, and it said to me 'pincushion'. It is startling how many things say that to me. So this past weekend at the awesome Carrigtwohill car boot sale, I bought some more bits of china to make into even more pincushions. I even made one with the little shot glass with the milkmaid on it. 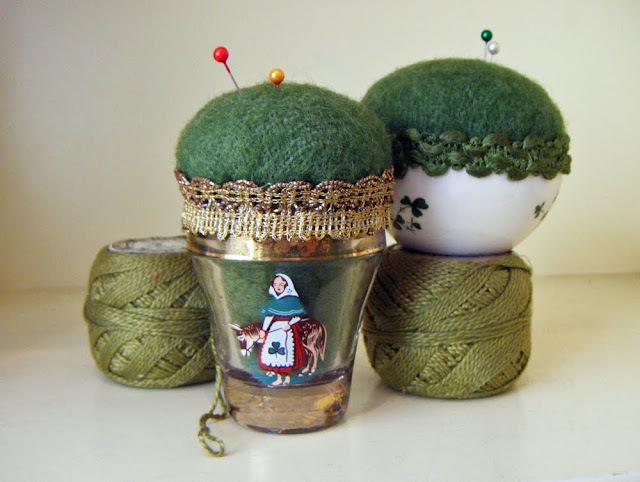 I literally eyed up everything as a possible pincushion, but I think it's out of my system now. My favourite is the Carrigaline china dish with the shamrocks on it, as it came out satisfyingly round. I also love the little vase with the strawberries on it. 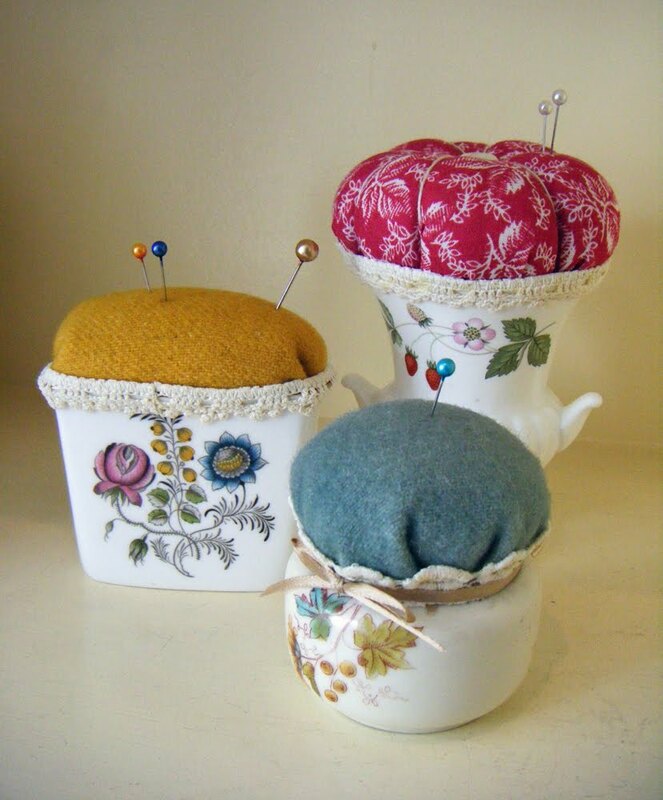 These are all very good pincushions, they sit very still while you do your business of putting pins in them, no trying to get away. I took my photos in a different spot with a different camera today. My beloved Lumix has memory card issues and really needs to pop up to Dublin to get sorted out, meanwhile I am using Kieran's little pocket cam. 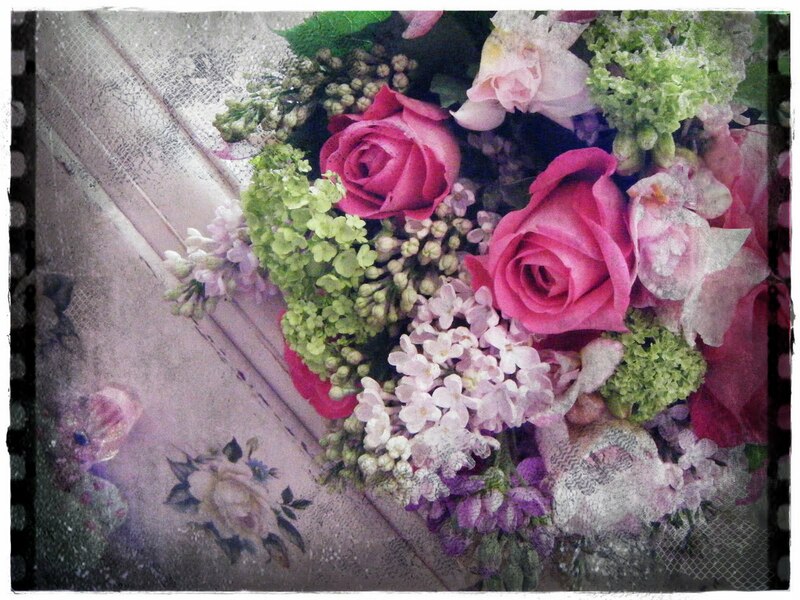 I took the photos on a shelf in the flower shop, instead of the window where I usually take them. They came out like a lightbox...I don't like it! I want my overexposed, Etsy-angle photos back! These will probably not make it up on Etsy until Monday. I suspect I will retake the pictures, I just can't let good enough alone. 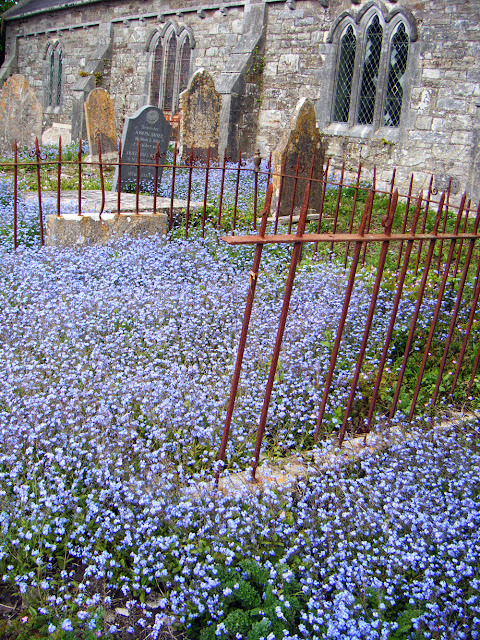 Went for a walk through the churchyard at St. Colman's Cathedral here in Cloyne, the forget-me-nots are amazing! 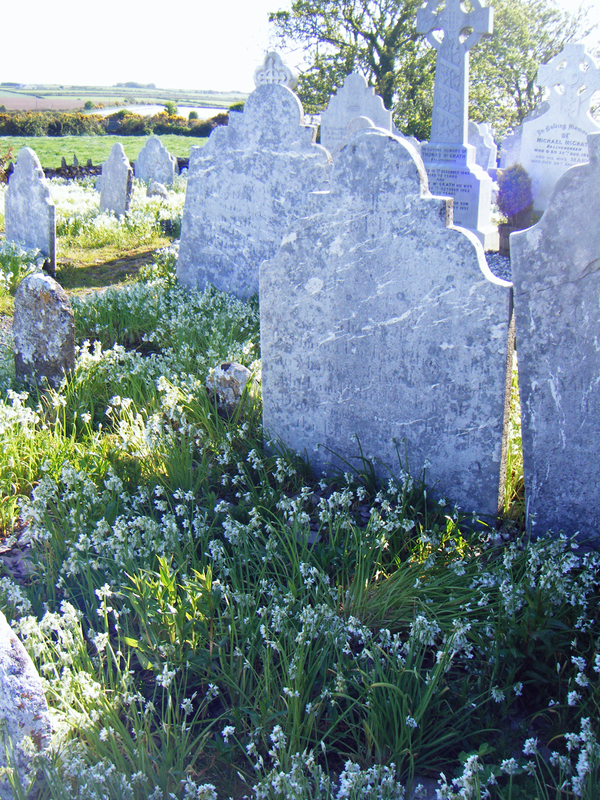 It's a real deserted cemetery, all wild and overgrown. The flowers are probably from a pot left on a grave decades ago, self-seeding over and over...all sorts of beautiful flowers everywhere. Last week we were in the churchyard in Churchtown South, which is completely overgrown with wild garlic! Very beautiful if unusually fragrant. It's a really stunning location, a ruined church set amongst farmer's fields with the sea in the distance. Beautiful spots for a quiet walk. I love this Etsy seller! Sonia, whose shop is called so thoughtfully, Cozy Memories. 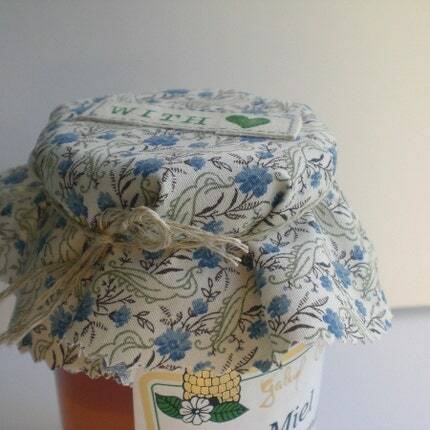 I first ran across her jam jar covers on Flickr (searching 'linen', I'm obsessed, I swear). 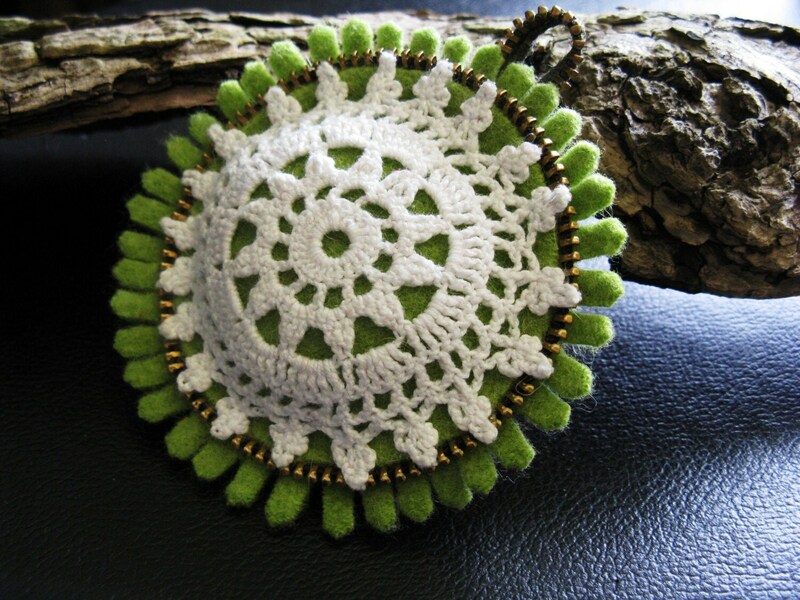 Then I found her Etsy shop, and she has just a lovely selection of sweet little items, each exactly the sort of thing that makes my eyes happy. Lots of linen and lace with a charming French domesticity that is always so effortless. The best, though, is her blog, gorgeous and colourful and lively. I have a little dream that we will retire to France someday...not so crazy, as it's only a boat ride away and we escaped the mortgage trap here in Ireland. I love Ireland but I would love to have a little more sunshine, a little bit nicer food, and maybe some of that charming, lazy, effortless domesticity. Sonia's blog, Cozy Homemaking, feeds that fantasy for me...and when I started clicking on her friends blogs (many of whom I recognise already from their beautiful art and photos! ), it all just left me wistful and convinced that my little dream is one I should nurture and prod at as much as possible. If you are feeling cozy and French now, spend an hour reading through her blog and blogroll! Such a treat. On May 6, 2008, I was very very pregnant, and tired of waiting for my son to make his debut. So my husband and I went for a long walk in Glenbower Wood, in Killeagh here in East Cork. We walked along the river up and down the hill to get that baby on the move. It worked, and by midnight I was in labour, and Henry was born the next day. We have decided to bring Henry for that same walk every year to mark his birthday. Happy 2nd Birthday Henry! You are the most beautiful thing I have ever made. So far I've only really blogged about my textile work and Etsy, but I am actually a three dimensional human being! 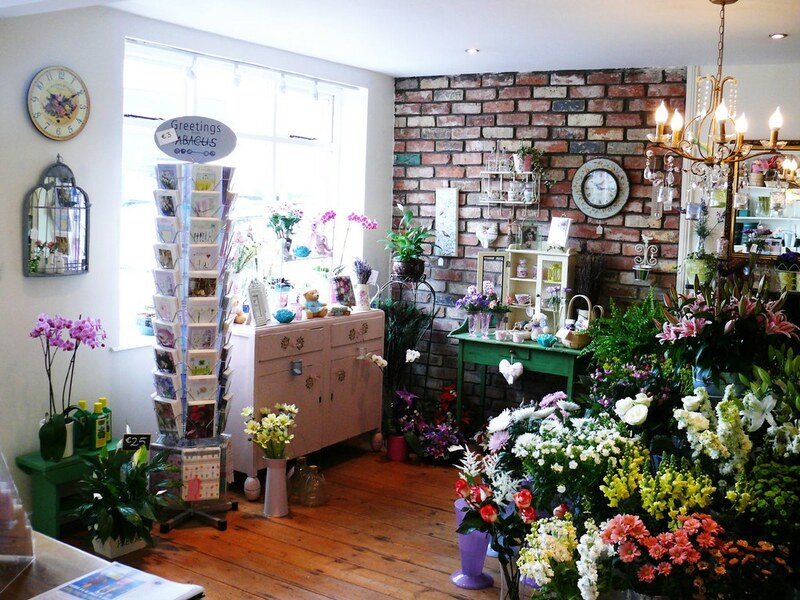 And I have a day job, I own a flower shop in Carrigtwohill, Co. Cork, called Bloomsday Flowers. I own the shop with my friend Noelle, and we will have been open for four years in June. 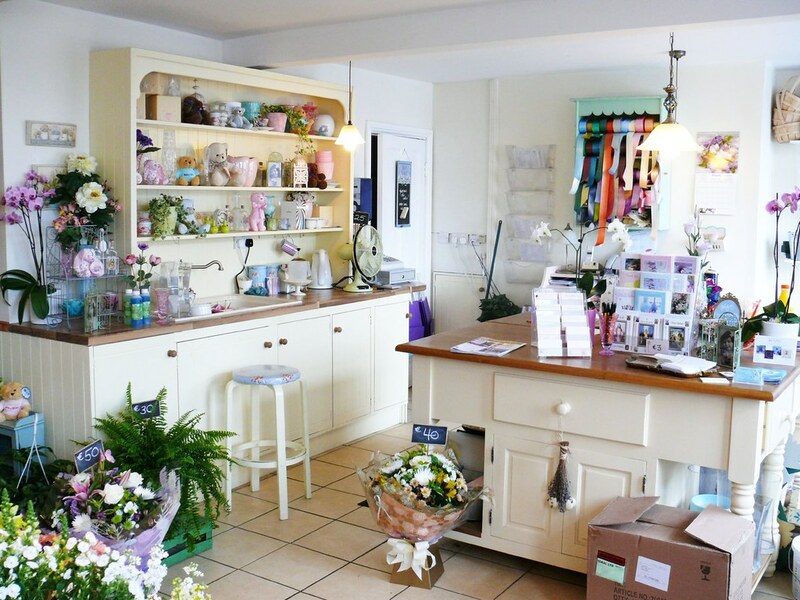 I love my shop and I love being a florist, it's a great job. I also love owning my own business, so that when we have a slow afternoon--and there are plenty of those these days unfortunately--I don't have to pretend to be busy, I can use that time to sew or blog or other things that make me happy. 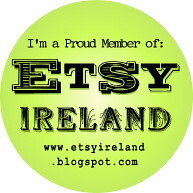 My shop is bright and beautiful and I love to spend time there! I was uploading some photos of last weeks weddings to our flickr account, and I played with one of the images in Photoshop, thought I would share it. If you'd like to see the flowers in all their blooming colour, visit Bloomsday's flickr account! Irish Wiskey Front, originally uploaded by creativebabiesetsy. 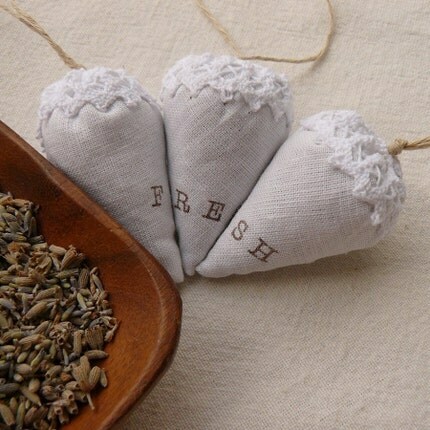 I ran across this photo a few months ago, and ever since then, I've been ruminating about what I could make out of those Irish linen tea towels. I don't have any, aside from a couple that I actually use as tea towels, but I never pass up an opportunity to start searching through eBay listings to start a new collection of something, which I may or may not eventually make into something else. I've seen plenty of tea towels at car boot sales, but now I'm pretty much guaranteed to never see another one. 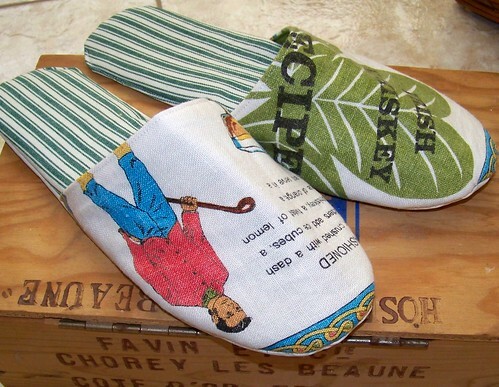 I looked at the slipper-maker's Etsy shop, and she has other cute and clever items made from Irish linen tea towels, but my favourite is the whiskey slippers. I wish I'd thought of that. Isn't this beautiful? It's by Namolio on Etsy. Her shop is stuffed full of so many beautiful things, all linen, cloth and thread. 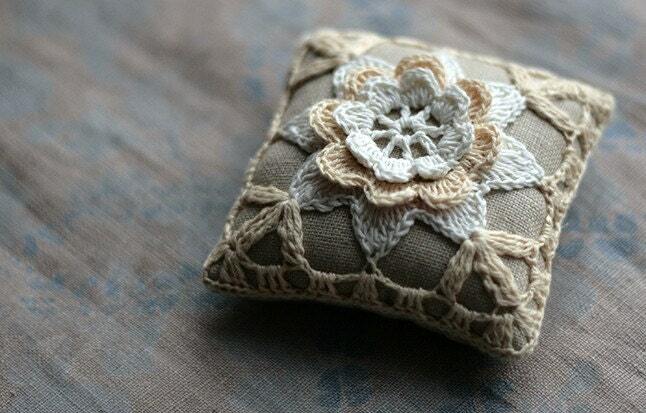 I think I am about to go through a linen period, I just need to find an Irish linen hook up. I can get it in the little needlecraft shop I go to, but I want big, ugly swaths of it, straight from the mill. Preferably some forgotten hoard of hand-dyed vintage linen, ha ha. Namolio has buttons and bias binding, too, I love it. Look at this photo on her Facebook page! I about died. So amazingly gorgeous. I need this recession to be over, all these pretties are haunting me!